Love , Love these sandals, very soft and comfy, definitely recommend! I’m very pleased with my purchase. 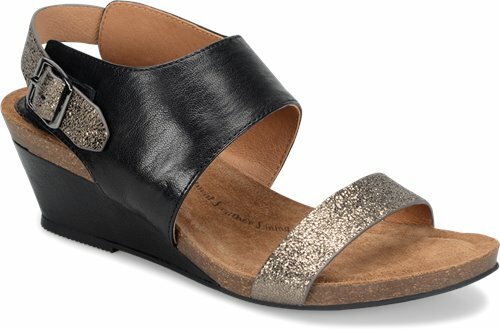 This sandals are exactly what I was looking for: leather inside and out, soft, heel not too high, not too low, very comfortable. The vanita provides a stylish way to dress up and still feel comfortable in a walking city. They are not tennis shoes but they are pretty and comfortable. Service is good and quick Amy Shoeline. Super cute and super comfortable! Such a cute, comfortable shoe! I walked all over San Francisco in them on a weekend excursion. No issues whatsoever. And I always get tons of compliments when I wear them. Plus the gold is a nice neutral...goes with everything! Can't wait for warm weather to return to the Pac NW so I can wear them again. Beautiful sandal! And the fit and the comfort of the shoe is great. I definitely recommend the purchase. Just recently discovered both Shoeline and Sofft shoes. The first of many happy purchases!